For the videogame, see T-72: Balkans On Fire! Synchromesh, hydraulically assisted, with 7 forward and 1 reverse gears. The development of the T-72 was a direct result of the introduction of the T-64 tank. The T-64 (Object 432) was a very ambitious project to build a competitive tank with a weight of not more than 36 tons under the direction of Alexander Morozov in Kharkov. To achieve that goal, the crew was reduced to three soldiers, saving the loader by introducing an automated loading system. This and other steps allowed a reduced weight, but caused problems when looking for a reliable engine to fit in the smaller hull. The production of the T-64 with a 115-mm gun began in 1964, but plans to build the T-64A with a more powerful 125-mm gun had already been made back in 1963. Problems with the first batch of T-64 tanks were centred on the 5TDF 700 hp engine and the auto loading mechanism. The engine was unreliable, was difficult to mend, and only had a guaranteed life span of a World War 2 era tank engine. A strong lobby around designer Morozov advocated for the T-64 in Moscow, preventing rival developments and ideas to be discussed. A mobilization model of the T-64 with the cheaper and much more reliable V-45 engine (780 hp) was to be developed by Uralvagonzavod, since the Malyshev Factory in Kharkov could not provide a sufficient number of 5TDF engines for all Soviet tank factories in wartime. The 5TDF was too complex and its production twice as costly as the V-45 engine. In 1967, the Uralvagonzavod formed "Section 520", which was to prepare the serial production of the T-64 for 1970. The team soon found out that the more powerful V-45 engine put a lot of stress on the fragile T-64 hull, so that after some time cracks started to materialize. A more stable solution had to be found. Finally, an idea from 1960 was used, when a modification of the T-62 had been discussed: In 1961, two prototypes of "Object 167" had been built by Uralvagonzavod to test a more powerful hull and running gear combination for that tank. Under influence from Kharkov, the idea had been turned down by Moscow. But this construction, with its big, rubbercoated roadwheels now formed the basis for the "mobilisation model" of the T-64. Additional changes were made to the automatic loading system, which also was taken from an earlier project, originally intended for a T-62 upgrade. 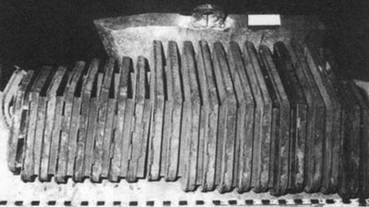 Ammunition, consisting of a separate projectile and a propellant charge was now stored horizontally on two levels, not vertically on one level like in the T-64. It was said to be more reliable than the T-64 autoloader. In 1964, two 125-mm guns of the D-81 type had been used to test their installation in the T-62, so the Ural plant was ready to adopt the 125-mm calibre for the T-64A as well. Uralvagonzavod produced the first prototype with a 125-mm gun and V-45K engine in 1968 as "Object 172". After intensive comparative testing with the T-64A, Object 172 was re-engineered in 1970 to deal with some minor problems. However, being only a "mobilization model", a serial production of Object 172 was not possible in peacetime. In an unclear political process decree number 326-113 was issued, which allowed the production of Object 172 in the Soviet Union from 1. January 1972 and freed Uralvagonzavod from the T-64A production. The first batch was built as "Object 172M" and, after some modifications, it was tested again in 1973 and accepted into service as the "T-72" under Soviet ministry directive number 554-172 dated 7 August 1973. At least some technical documentation on the T-72 is known to have been passed to the CIA by the Polish Colonel Ryszard Kuklinski between 1971 and 1982. The initial T-72 production model. The 1st series production of T-72 Object 172M begun in July at UKBM Nizhny Tagil. 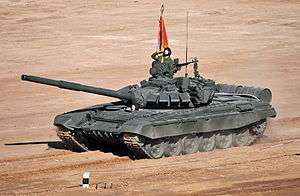 However, due to difficulties in getting the factory organised for the change in production from T-64 to T-72, only 30 completed tanks were delivered in 1973. Troubles continued in 1974 where out of state production quota of 440 only 220 were officially declared, with the actual number of completed tanks being close to 150. As a result, substantial investment in tooling was undertaken. Only after the factory was modernised could full-scale production of the T-72 begin. Nizhny Tagil produced T-72 in various forms until 1992. The T-72 was the most common tank used by the Warsaw Pact from the 1970s to the collapse of the Soviet Union. It was also exported to other countries, such as Finland, India, Iran, Iraq, Syria and Yugoslavia, as well as being copied elsewhere, both with and without licenses. Licensed versions of the T-72 were made in Poland and Czechoslovakia, for Warsaw Pact consumers. These tanks had better and more consistent quality of make but with inferior armour, lacking the resin-embedded ceramics layer inside the turret front and glacis armour, replaced with all steel. The Polish-made T-72G tanks also had thinner armour compared to Soviet Army standard (410 mm for turret). Before 1990, Soviet-made T-72 export versions were similarly downgraded for non-Warsaw Pact customers (mostly the Arab countries). Many parts and tools are not interchangeable between the Russian, Polish and Czechoslovakian versions, which caused logistical problems. Yugoslavia developed the T-72 into the more advanced M-84, and sold hundreds of them around the world during the 1980s. The Iraqis called their T-72 copies the "Lion of Babylon" (Asad Babil). These Iraqi tanks were assembled from "spare parts" sold to them by Russia as a means of evading the UN-imposed weapons embargo. More modern derivatives include the Polish PT-91 Twardy. Several countries, including Russia and Ukraine, also offer modernization packages for older T-72s. Various versions of the T-72 have been in production for decades, and the specifications for its armour have changed considerably. Original T-72 tanks had homogeneous cast steel armour incorporating spaced armour technology and were moderately well protected by the standards of the early 1970s. 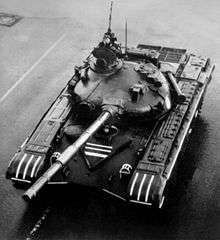 In 1979, the Soviets began building T-72 modification with composite armour similar to the T-64 composite armour, in the front of the turret and the front of the hull. Late in the 1980s, T-72 tanks in Soviet inventory (and many of those elsewhere in the world as well) were fitted with reactive armour tiles. Laser rangefinders have appeared in T-72 tanks since 1978; earlier examples were equipped with parallax optical rangefinders, which could not be used for distances under 1,000 metres (1,100 yd). Some export versions of the T-72 lacked the laser rangefinder until 1985 or sometimes only the squadron and platoon commander tanks (version K) received them. After 1985, all newly made T-72s came with reactive armour as standard, the more powerful 840 bhp (630 kW) V-84 engine and an upgraded design main gun, which can fire guided anti-tank missiles from the barrel. With these developments, the T-72 eventually became almost as powerful as the more expensive T-80 tank, but few of these late variants reached the economically ailing Warsaw Pact allies and foreign customers before the Soviet bloc fell apart in 1990. Since 2000, export vehicles have been offered with thermal imaging night-vision gear of French manufacture as well (though it may be more likely that they might simply use the locally manufactured 'Buran-Catherine' system, which incorporates a French thermal imager). Depleted uranium armour-piercing ammunition for the 125 mm (4.9 in) gun has been manufactured in Russia in the form of the BM-32 projectile since around 1978, though it has never been deployed, and is less penetrating than the later tungsten BM-42 and the newer BM-42M. Main models of the T-72, built in the Soviet Union and Russia. Command tanks have K added to their designation for komandirskiy, "command", for example T-72K is the command version of the basic T-72. Versions with reactive armour have V added, for vzryvnoy, "explosive". Original version, armed with 125 mm smoothbore tank gun and optical coincidence rangefinder. The upgraded T-72A which appeared in 1979. This vehicle is the basis for the most numerous export version - the T-72M and T-72M1. Added laser rangefinder and electronic fire control, turret front and top being heavily reinforced with composite armour (nicknamed Dolly Parton by US intelligence), provisions for mounting reactive armor, smoke grenade launchers, flipper armour mount on front mudguards, internal changes. Export version, similar to T-72A. Also built in Poland and former Czechoslovakia. BMPT – Heavy convoy and close tank support vehicle. TOS-1 – Thermobaric rocket launcher, with 30-tube launcher in place of the turret. BREM-1 (Bronirovannaya Remonto-Evakuatsionnaya Mashina) – Armoured recovery vehicle with a 12-tonne crane, 25-tonne winch, dozer blade, towing equipment, and tools. IMR-2 (Inzhenernaya Mashina Razgrashdeniya) – Combat engineering vehicle with an 11-tonne telescoping crane and pincers, configurable dozer blade/plough, and mine-clearing system. MTU-72 (Tankovyy Mostoukladchik) – Armoured bridge layer, capable of laying a 50 t (55 short tons) capacity bridge spanning 18 m (59 ft) in three minutes. The T-72 shares many design features with other tank designs of Soviet origin. Some of these are viewed as deficiencies in a straight comparison to NATO tanks, but most are a product of the way these tanks were envisioned to be employed, based on the Soviets' practical experiences in World War II. The T-72 is extremely lightweight, at forty-one tonnes, and very small compared to Western main battle tanks. Some of the roads and bridges in former Warsaw Pact countries were designed such that T-72s can travel along in formation, but NATO tanks could not pass at all, or just one-by-one, significantly reducing their mobility. The basic T-72 is relatively underpowered, with a 780 hp (580 kW) supercharged version of the basic 500 hp (370 kW) V-12 diesel engine originally designed for the World War II-era T-34. The 0.58 m (1 ft 11 in) wide tracks run on large-diameter road wheels, which allows for easy identification of the T-72 and descendants (the T-64/80 family has relatively small road wheels). The T-72 is designed to cross rivers up to 5 m (16.4 ft) deep submerged using a small diameter snorkel assembled on-site. The crew is individually supplied with a simple rebreather chest-pack apparatus for emergency situations. If the engine stops underwater, it must be restarted within six seconds, or the T-72's engine compartment becomes flooded due to pressure loss. The snorkeling procedure is considered dangerous, but is important for maintaining operational mobility. The T-72 has a comprehensive nuclear, biological, and chemical (NBC) protection system. The inside of both hull and turret is lined with a synthetic fabric made of boron compound, meant to reduce the penetrating radiation from neutron bomb explosions. The crew is supplied clean air via an extensive air filter system. A slight over-pressure prevents entry of contamination via bearings and joints. Use of an autoloader for the main gun allows for more efficient forced smoke removal compared to traditional manually loaded ("pig-loader") tank guns, so NBC isolation of the fighting compartment can, in theory, be maintained indefinitely. Exported T-72s do not have the antiradiation lining. Like all Soviet-legacy tanks, the T-72's design has traded off interior space in return for a very small silhouette and efficient use of armour, to the point of replacing the fourth crewman with a mechanical loader. The basic T-72 design has extremely small periscope viewports, even by the constrained standards of battle tanks and the driver's field of vision is significantly reduced when his hatch is closed. The steering system is a traditional dual-tiller layout instead of the easier-to-use steering wheel or steering yoke common in modern Western tanks. This set-up requires the near-constant use of both hands, which complicates employment of the seven speed manual transmission. T-72A top view. This model sports thick "Dolly Parton" composite armour on the turret front. Armour protection of the T-72 was strengthened with each succeeding generation. The original T-72 "Ural" Object 172M (from 1973) turret is made from conventional cast HHS steel armour with no laminates insert. It is believed that the maximum thickness is 280 mm (11 in), the nose is 80 mm (3.1 in). The glacis of the new laminated armour is 205 mm (8.1 in) thick, comprising 80 mm (3.1 in) HHS steel, 105 mm (4.1 in) double layer of laminate and 30 mm (1.2 in) RHA steel, which when inclined gives about 500–600 mm (20–24 in) thickness along the line of sight. In 1977 the armour of the T-72 Object 172M was slightly changed. The turret now featured insert filled with ceramic sand bars "kwartz" rods and the glacis place composition was changed. It was now made up of 60 mm (2.4 in) HHA steel,105 mm (4.1 in) glass Tekstolit laminate and 50 mm (2.0 in) RHA steel. This version was often known in Soviet circles as T-72 "Ural-1". The next armour update was introduced by the T-72A (Object 176), which was designed in 1976 and replaced the original on the production lines during 1979-1985. T-72 Object 1976 is also known as T-72A. With the introduction of the T-72B (Object 184) in 1985, the composite armour was again changed. According to retired Major James M. Warford, variants developed after the T-72 Base Model and T-72M/T-72G MBTs, featured a cast steel turret that included a cavity filled with quartz or sand in a form similar to US “fused-silica" armor. Steven J. Zaloga on the other hand mentions that the T-72 Model 1978 (Obiekt 172M sb-4), which entered production in 1977, featured a new turret with special armor composed of ceramic rods. The T-72A featured a new turret with thicker but nearly vertical frontal armour. Due to its appearance, it was unofficially nicknamed "Dolly Parton" armour by the US Army. This used the new ceramic-rod turret filler, incorporated improved glacis laminate armor and, mounted new anti-shaped-charge sideskirts. The T-72M was identical to the base T-72 Ural model in terms of protection, retaining the monolithic steel turret. The modernized T-72M1 was closer to the T-72A in terms of protection. It featured an additional 16 mm (0.63 in) of High Hardness Steel appliqué armour on the glacis plate, which produced an increase of 43 mm (1.7 in) in line of sight thickness. It was also the first export variant with composite armour in the turret containing ceramic rods sometimes called "sandbar armour". The turret armor composition was essentially identical to the T-72 "Ural-1" where as Soviet only T-72A had slightly increased turret protection. Several T-72 models featured explosive reactive armour (ERA), which increased protection primarily against HEAT type weapons. Certain late-model T-72 tanks featured heavy ERA to help defeat modern HEAT and AP against which they were insufficiently protected. Late model T-72s, such as the T-72B, featured improved turret armour, visibly bulging the turret front—nicknamed "Super-Dolly Parton" armour by Western intelligence. The turret armour of the T-72B was the thickest and most effective of all Soviet tanks; it was even thicker than the frontal armour of the T-80B. The T-72B used a new "reflecting-plate armor" (bronya s otrazhayushchimi listami), in which the frontal cavity of the cast turret was filled with a laminate of alternating steel and non-metallic (rubber) layers. The glacis was also fitted with 20 mm (0.8 in) of appliqué armour. The late production versions of the T-72B/B1 and T-72A variants also featured an anti-radiation layer on the hull roof. Early model T-72s did not feature side skirts; instead, the original base model featured gill or flipper-type armour panels on either side of the forward part of the hull. When the T-72A was introduced in 1979, it was the first model to feature the plastic side skirts covering the upper part of the suspension, with separate panels protecting the side of the fuel and stowage panniers. The July 1997 issue of Jane's International Defence Review confirmed that after the collapse of the USSR, US and German analysts had a chance to examine Soviet-made T-72 tanks equipped with Kontakt-5 ERA, and they proved impenetrable to most modern US and German tank projectiles;: KE-effective ERA, such as Kontakt-5, drove the development of M829A3 ammunition. The following table shows the estimated protection level of different T-72 models in rolled homogeneous armour equivalency. i.e., the composite armour of the turret of a T-72B offers as much protection against an APFSDS round as a 520 millimetres (20 in) thick armour steel layer. Possible easy replacement instead of Kontakt 5 (or 1) install Relikt. Acceptably an exact formula (for 5)× ((equivalent of armor − 20%) = result + 40%. This will be the equivalent of fresh of armor set by Relikt vs APFSDS). T-72B + Relikt vs APFSDS, turret 860-900, hull-770. Officially, the Relikt is not used, but is offered for export (for T-90MS Relikt is a basic set, for the T-90S basic set – Kontakt 5). The T-72 is equipped with the 125 mm (4.9 in) 2A46 series main gun, a significantly larger (20-mm larger) calibre than the standard 105 mm (4.1 in) gun found in contemporary Western MBTs, and still slightly larger than the 120 mm/L44 found in many modern Western MBTs. As is typical of Soviet tanks, the gun is capable of firing anti-tank guided missiles, as well as standard main gun ammunition, including HEAT and APFSDS rounds. The original T-72 Object 172M (1973) used 2A26M2 model gun first mounted on T-64. The barrel had a length of 6350mm or 50.8 calibers and had maximum rated chamber pressure of 450 MPa. The cannon had an electroplated chrome lining but lacked a thermal sleeve. The cannon was capable of firing 3VBM-3 round with 3BM-9 steel projectile sabot and 3VBM-6 round with 3BM-12 Tungsten sabot APFSDS projectile. Allowing respectively 245 mm (9.6 in) and 280 mm (11 in) penetration of RHA steel at 2000m at 0 degree angle. In addition to APFSDS rounds T-72 Object 172M could also fire 3VBK-7 round incorporating 3BK-12 HEAT warhead and 3VBK-10 round incorporating 3BK-14 HEAT warhead. HEAT rounds allowed respectively 420 mm (17 in) and 450 mm (18 in) penetration of RHA steel at 0 degree angle. The High Explosive rounds provided included 3WOF-22 with 3OF-19 warhead or 3WOF-36 with the 3OF-26 warhead. For all rounds, the Zh40 propellant was used. Complementing the original gun setup was 2E28M "Siren" two-plane electrohydraulic stabilizer allowing automatic stabilization with speeds from 0.05 to 6 degrees per second. Even as the T-72 Object 172M (1973) was entering production new ammunition was developed to offset armor developments in the West. Beginning in 1972, two new APFSDS rounds were introduced, the 3VBM-7 round with 3BM-15 Tungsten sabot projectile and the "cheaper" 3VBM-8 round with 3BM-17 sabot but without the tungsten carbide plug. These allowed penetration of respectively 310 mm (12 in) and 290 mm (11 in) RHA steel at 2000m at 0 degree angle. At the same time, a universal Zh52 propellant charge was introduced. The 3VBM-7 was the most common APFSDS round found in the Soviet T-72 Object 172M tanks during the 70s. The stated barrel life expectancy of the 2A26M2 model gun was 600 rounds of HE/HEAT equivalent to 600 EFC (Effective Full Charge) or 150 rounds of APFSDS. The main gun of the T-72 has a mean error of 1 m (39.4 in) at a range of 1,800 m (1,968.5 yd). Its maximum firing distance is 9,100 m (9,951.9 yd), due to limited positive elevation. The limit of aimed fire is 4,000 m (4,374.5 yd) (with the gun-launched anti-tank guided missile, which is rarely used outside the former USSR). The T-72's main gun is fitted with an integral pressure reserve drum, which assists in rapid smoke evacuation from the bore after firing. The 125 millimeter gun barrel is certified strong enough to ram the tank through forty centimeters of iron-reinforced brick wall, though doing so will negatively affect the gun's accuracy when subsequently fired. Rumours in NATO armies of the late Cold War claimed that the tremendous recoil of the huge 125 mm gun could damage the fully mechanical transmission of the T-72. The tank commander reputedly had to order firing by repeating his command, when the T-72 is on the move: "Fire! Fire!" The first shout supposedly allowed the driver to disengage the clutch to prevent wrecking the transmission when the gunner fired the cannon on the second order. In reality, this still-common tactic substantively improves the tank's firing accuracy and has nothing to do with recoil or mechanical damage to anything. This might have to deal with the lower quality (compared to Western tanks) of the T-72's stabilizers. The vast majority of T-72s do not have FLIR thermal imaging sights, though all T-72s (even those exported to the Third World) possess the characteristic (and inferior) 'Luna' Infrared illuminator. Thermal imaging sights are extremely expensive, and the new Russian FLIR system, the 'Buran-Catherine Thermal Imaging Suite' was only introduced recently on the T-80UM tank. Most T-72s found outside the former Soviet Union do not have laser rangefinders. T-72 built for export have a downgraded fire-control system. Like the earlier domestic-use-only T-64, the T-72 is equipped with an automatic loading system, eliminating the need for a dedicated crewmember, decreasing the size of the tank, and hence the mass. However, the autoloader is of noticeably different design. Both the T-64 and T-72 carry their two-section 125 mm ammunition (shell and full propellant charge, or missile and reduced propellant charge) in separate loading trays positioned on top of each other; but firstly, in T-64, 28 of these were arranged vertically as a ring under the turret ring proper, and were rotated to put the correct tray into position under the hoist system in the turret rear. This had the disadvantage of cutting the turret off from the rest of the tank, most notably, the driver. Accessing the hull required partial removal of the trays. T-72 uses a design that has lower width requirements, and does not isolate the turret compartment: the trays are arranged in a circle at the very bottom of the fighting compartment; the payoff is the reduction of the number of trays to 22. The second difference was that in the T-64 the trays were hinged together and were flipped open as they were brought into position, allowing both the shell/missile and propellant charge to be rammed into the breech in one motion; in T-72 the tray is brought to the breech as-is, with the shell in the lower slot and the charge in the upper one, and the mechanical rammer sequentially loads each of them, resulting in a longer reloading cycle. The autoloader has a min cycle of 6.5 seconds (ATGM 8 seconds) and a max cycle of 15 seconds for reload, in later versions, the sequence mode allows to reload in less than 5 seconds allowing to reach 3 shots in 13 seconds. The autoloader system also includes an automated casing removal mechanism that ejects the propellant case through an opening port in the back of the turret during the following reload cycle. The autoloader disconnects gun from the vertical stabilizer and cranks it up three degrees above the horizontal in order to depress the breech end of the gun and line it up with the loading tray and rammer. While loading, the gunner can still aim because he has a vertically independent sight. With a laser rangefinder and a ballistic computer, final aiming takes at least another three to five seconds, but it is pipelined into the last steps of auto-loading and proceeds concurrently. In addition to the 22 auto-loaded rounds, the T-72 carries 17 rounds conventionally in the hull, which can be loaded into the emptied autoloader trays or directly into the gun—slowly and awkwardly, due to the absence of a human loader. The T-72 was never used in the Afghanistan War. The 40th Soviet Army that was deployed there had only T-55 and T-62 tanks. The Russian Federation has over 5,000 T-72 tanks in use, including around 2,000 in active service and 3,000 in reserve. 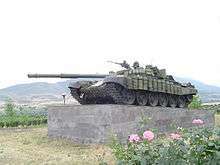 The T-72 has been used by the Russian Army in the fighting during the First and Second Chechen Wars and the Russo-Georgian War. The T-72 has been used by over 40 countries worldwide. In the 1982 Lebanon War, Syrian T-72s engaged Israeli M60A1 and probably Merkava tanks in the south of Lebanon. On 9 June 1982, the Syrian General HQ ordered a brigade of the 1st Armored Division, equipped with T-72 tanks, to move straight ahead, cross the border, and hit the right flank of the Israeli units advancing along the eastern side of Beka'a, destroying some Israeli companies. After the war, the Syrian president Hafez Al-Assad called it "the best tank in the world". The T-72 has been in extensive use in the Syrian Civil War by the Syrian Arab Army since 2011 and quite a few captured examples are used by the anti-government Free Syrian Army rebels and jihadists groups such as the Islamic Front and the Islamic State of Iraq and Syria. During the Syrian Civil War, government forces used T-72s, among other armored vehicles, against the opposition forces. Initially, the insurgent forces were forced to use IED's and RPG-7 ambush tactics against the government armored forces. Later, modern Russian RPGs and Yugoslav M79 Osas were recorded in rebel hands and being used to get successful hits on T-72s. Starting in 2012, the capture from Syrian stocks and later direct delivery by external sponsors of modern anti-tank guided missiles, including Chinese made HJ-8, Soviet made 9K111 Fagot, 9M113 Konkurs and 9K115 Metis and American made TOW enabled the opposition forces to successfully engage and destroy any government armored vehicle types, T-72 included, from safer distances. The Iraqi T-72Ms performed spectacularly against opposing Iranian tanks, such as Pattons and Chieftain, in the Iran–Iraq war. In the early stages of the war, an Iraqi battalion of T-72 tanks faced an Iranian battalion of Chieftain tanks. According to both Iranians and Iraqis,the T-72 was the most feared tank in the war. The Iraqi assembled T-72 version Lion of Babylon engaged Western forces in both Iraq wars. Battle of 73 Easting took place during a sandstorm in the Iraqi desert. American M1A1s and Bradley Fighting Vehicles came up against Iraqi Republican Guard T-72s and BMPs and inflicted heavy losses on Iraqi armored forces while taking none in return. The primary battle was conducted by 2ACR's three squadrons of about 400 soldiers, along with the 1st Infantry Division's two leading brigades, who attacked and destroyed the Iraqi 18th Mechanized Brigade and 37th Armored Brigade of the Tawakalna Division, each consisting of between 2,500 and 3,000 personnel. On 26 February 1991, the Iraqis used dug-in T-72 tanks to stop the advance of an American mechanized infantry company supported by two M1 tanks in southern Iraq during the Battle of Phase Line Bullet. The Iraqi T-72Ms used 3BM9 shells (removed from service in the USSR in 1973), with a penetration of 245 mm at a distance of up to 2500 meters. In January 2009, it was reported that the Iraqi government was negotiating a deal to purchase up to 2,000 T-72 tanks. The T-72s were to be rebuilt and modernized. During the first Chechen campaign, Russia used 225 T-72 and T-80 tanks. The Kobra tank-launched missiles were used, which effectively destroyed targets at a range of 4 km. During the three months of fighting, 15 T-72B and about 5 T-72A were destroyed. 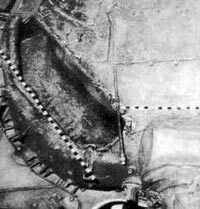 In all cases, the tanks were destroyed when hit in the side or on the top; the frontal armor was never penetrated. Dudayev's forces had dozens of T-62 and T-72 tanks (with white turrets). In the summer of 1994, Russian aircraft destroyed about 15 of Dudayev's tanks. After the assault by the Russian army during the winter of 1994, Dudayev's last 30 tanks were destroyed or captured. Seven captured T-72s were used in combat by the Russian army. During the first war, at least two tank duels took place. In the first one, Dudayev's T-72A knocked out one T-62M belonging to pro-Russian Chechens. In the second duel, one of Dudayev's T-72As was destroyed by a Russian T-72B. From 1997 to 2003, Chechen rebels managed to destroy only three Russian T-72s, including only one tank during the second Chechen campaign. 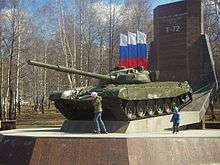 During the war, Russia lost two T-72B tanks. In one case a platoon of four Russian T-72s destroyed more than 15 Georgian armored vehicles on the streets of Tskhinvali, while losing one tank. During the five days of war, several Georgian T-72 tanks were destroyed or captured, including most of the Israeli modifications T-72SIM. On 26 August 2014, International Institute for Strategic Studies claimed that it has identified a mixed column composed of at least 3 T-72B1s and a lone T-72BM. The significance of this sighting was that Russia attempted to maintain plausible deniability over the issue of supplying tanks and other arms to the separatists. Russia continuously claimed that any tanks operated by the separatists must have been captured from Ukraine's own army. The T-72BM is in service with the Russian Army in large numbers. This modernized T-72 is not known to have been exported to nor operated by any other country. In an interview with Dorzhi Batomunkuev on 4 March 2015, it was revealed that he operated a T-72B as part of a 32 tank Russian army unit when fighting for Debaltseve in Ukraine in February 2015. His tank was destroyed and he suffered severe burns. According to globalsecurity.org Ukraine had, before the war, about 1,700 variants of the T-72, down to 600 in 2014 (warehousing condition outside Army). In September 2009, it was announced that Venezuela was planning to purchase 92 Russian T-72B1V tanks. The first T-72s destined for Venezuela arrived at the port of Puerto Cabello on 25 May 2011. In June 2012, Russia and Venezuela agreed on a deal for 100 more T-72B1Vs. This purchase has led to the dismissal and prosecution of officials for bribery. Xu Bin-shi, a high ranking Chinese military engineer, revealed during an interview that China first obtained a T-72 from Romania in the 1980s, in exchange for plasma spray technology. 1994–1996 First Chechen War (Russia, Chechnya (limited)) First known case of using tank-launched missiles, which effectively destroy targets at 4 km range. 1 2 "Gary's Combat Vehicle Reference Guide". Retrieved 15 November 2014. ↑ "T-72B(M) Main Battle Tank". armor.kiev.ua. Retrieved 2016-08-24. ↑ Christopher Foss: Jane's Armour & Artillery 2009–2010.ISBN 978-0-7106-2882-4 p. 102. ↑ Steven Zaloga: M1 Abrams vs T-72 Ural: Operation Desert Storm 1991. p. 16. ↑ Ustyantsev, p. 32 ff. 1 2 Ustyantsev, p. 39, 40. 1 2 Sergey Suvorov: Tank T-72 Yesterday, Today, Tomorrow p. 4. 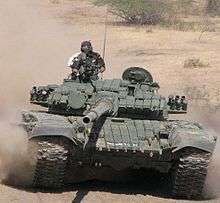 ↑ Sergey Suvorov: Tank T-72 Yesterday, Today, Tomorrow p. 6. 1 2 3 4 "War Technology"
1 2 3 4 5 "JED The Military Equipment Directory"(registration required) Archived 12 October 2007 at the Wayback Machine. ↑ Perret 1987, p. 121. ↑ "Official physique requirements for servicemen (Таблица дополнительных требований к состоянию здоровья граждан)". ↑ Warford, James M. (1999). "Soviet-Russian Tank Turret Armor: The Cold War Shell-Game". ARMOR magazine. 1 2 Zaloga, Steven (2009). M1 Abrams vs T-72 Ural: Operation Desert Storm 1991. Osprey. p. 20. ↑ Zaloga, Steven (2009). M1 Abrams vs T-72 Ural: Operation Desert Storm 1991. Osprey. p. 21. ↑ Zaloga, Steven (2009). M1 Abrams vs T-72 Ural: Operation Desert Storm 1991. Osprey. p. 27. ↑ Zaloga, Steven (2009). M1 Abrams vs T-72 Ural: Operation Desert Storm 1991. Osprey. p. 22. ↑ Zaloga, Steven (2009). M1 Abrams vs T-72 Ural: Operation Desert Storm 1991. Osprey. p. 23. ↑ Zaloga, Steven J. (2009). T-80 Standard Tank: The Soviet Army's Last Armored Champion. p. 19. ↑ "M829E3 120mm Armor-Piercing Fin-Stabilized Discarding Sabot- Tracer (APFSDS-T) Cartridge" (PDF). ↑ "Вооружения, Военная Техника, Военно-Технический Сборник, Современное Состояние, История Развития Опк, Бастион Втс, Невский Бастион, Журнал, Сборник, Впк, Армии, Выставки, Салоны, Военно-Технические, Новости, Последние Новости, Военные Новости, События Факты Впк, Новости Опк, Оборонная Промышленность, Министрество Обороны, Силовых Структур, Красная Армия, Советская Армия, Русская Армия, Зарубежные Военные Новости, Вивт, Пвн". bastion-karpenko.ru. 1 2 3 "Основной танк Т-72/Т-90". armor.kiev.ua. ↑ С. Устьянцев, Д. Колмаков. Т-72. — Нижний Тагил: Уралвагонзавод / Медиа-Принт, 2004. — С. 167. — (Боевые машины Уралвагонзавода № 1). — 5000 экз. — ISBN 5-98485-003-6. 1 2 "waronline.org - Танк Т-72 в мире: ТТХ основных моделей". waronline.org. 1 2 "Т-72Б "Рогатка"". Retrieved 15 November 2014. ↑ S. Zaloga, M. Jerchel, S. Sewell T-72 Main Battle Tank 1974–1993. — London: Osprey Publishing, 1993. — С. 39. — 48 с. — (New Vanguard № 6). — ISBN 1-85532-338-9. 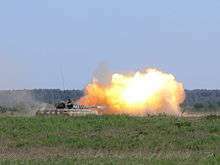 ↑ "Vasiliy Fofanov's Modern Russian Armour Page". Retrieved 15 November 2014. ↑ "ОСНОВНОЙ БОЕВОЙ ТАНК T-72". narod.ru. ↑ "ПРИМЕНЕНИЕ РАЗРАБОТОК НА ВиВТ". niistali.ru. 1 2 "ПРИМЕНЕНИЕ РАЗРАБОТОК НА ВиВТ". niistali.ru. ↑ "NII STALI JSR". niistali.ru. ↑ "Syria - T-72 gets hit by RPG 29 and cooking off, 2014". YouTube. Retrieved 15 November 2014. ↑ "FSA rebels destroy moving T-72 with HJ-8 "Red Arrow" ATGM + cook off". YouTube. Retrieved 15 November 2014. ↑ "Танки и БМП в бою: опыт современных войн". modernarmy.ru. ↑ "ABRAMS в Персидском заливе. Звёздный час". techno-story.ru. ↑ "Танк Т-72: вчера, сегодня, завтра". narod.ru. ↑ "2. БОЕПРИПАСЫ ТАНКОВЫХ ОРУДИЙ". militaryparitet.com. ↑ Osborn, Kris. "Iraq Plans To Buy 2,000 Tanks". Defense News, 12 January 2009. ↑ "Грозный. Танки. Как это было". Retrieved 15 November 2014. ↑ "О развитии отечественного танкостроения". Retrieved 15 November 2014. ↑ "Танки Т-62 в Чечне". Военно-патриотический сайт «Отвага». Retrieved 15 November 2014. ↑ "История ВВС Ичкерии". Retrieved 15 November 2014. ↑ "Рейды чеченских боевиков". Retrieved 15 November 2014. ↑ Фаличев О Армия ХХI века/ Интервью с главнокомандующим сухопутными войсками РФ Н. Кормильцевым // Военно-промышленный курьер. — 2003. — № 9. ↑ "Погибли без боя". .Ru. Retrieved 15 November 2014. ↑ "Танк Т-72 в мире". Retrieved 15 November 2014. ↑ "Яковлев Юрий Павлович". Retrieved 15 November 2014. ↑ "Мыльников Сергей Андреевич". Retrieved 15 November 2014. ↑ Marcus, Jonathan (27 August 2014). "Ukraine crisis: T-72 tank shoots hole in Russian denial". BBC. Retrieved 28 August 2014. ↑ "Ukraine crisis: Interview with a Russian tank crewman". Novaya Gazeta. 4 March 2015. Retrieved 4 March 2015. ↑ John Pike. "Ukraine Weapons". globalsecurity.org. ↑ The Military Balance 2014. — P. 195. ↑ "Americas - Russia lends Chavez $2bn for arms". Al Jazeera English. 2009-09-14. Retrieved 2010-07-30. ↑ "Llegaron mas tanque y artilleria". Notitarde. 2011-05-26. ↑ "Venezuela to Buy More Russian T-72 Tanks". Ria Novosti. 2013-06-27. ↑ "Sierra Leone, 1990-2002". Acig.org. Retrieved 2010-07-30. ↑ Nigeria deploy new T-72 tanks against Boko Haram in Baga Joseph Dempsey on Twitter. Ilyin, Vladimir; Nikolski, Mikhail (1997). "Sovremennye tanki v boiu" [Modern Tanks in Battle]. Tehnika i vooruzhenie [Machinery and Armament] (in Russian) (1). Wikimedia Commons has media related to T-72 tanks.